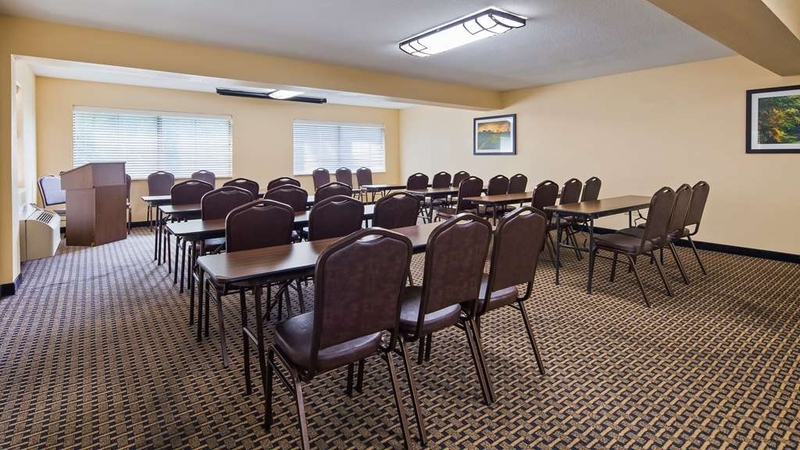 The Best Western Executive Suites - Columbus East is ideally located in the center of Pickerington. Come and experience our hotel near the major tourist attractions. Best price guaranteed and exclusive deals. King Suite Guest Room with in-room whirlpool tub. This spacious and tranquil all suites property is minutes from downtown, OSU, Ohio Fairgrounds and numerous restaurants. 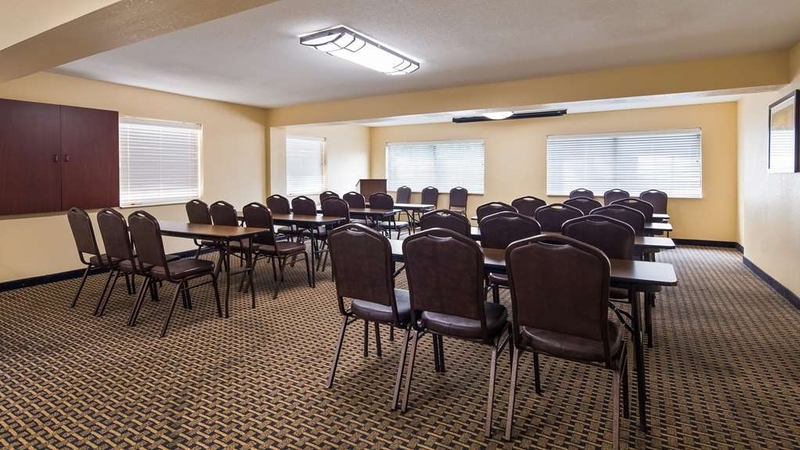 The Best Western Executive Suites – Columbus East has convenient access to the American Motorcyclist Association Museum, the Americana Parkway Business Center, Dept of Commerce, Dept of Agriculture, Bureau of Workers and Fire Academy. Rest, relax and rejuvenate as you take in the tranquil surroundings, with pond and stream nearby. 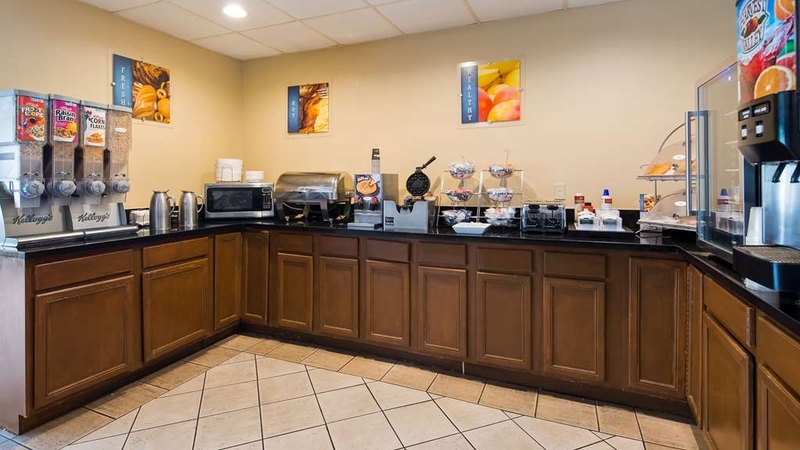 Conveniently located off of central Ohio's Interstate 70, in a Columbus area suburb, the Best Western Executive Suites - Columbus East provides all-suite accommodations and full service amenities at an unbeatable value. 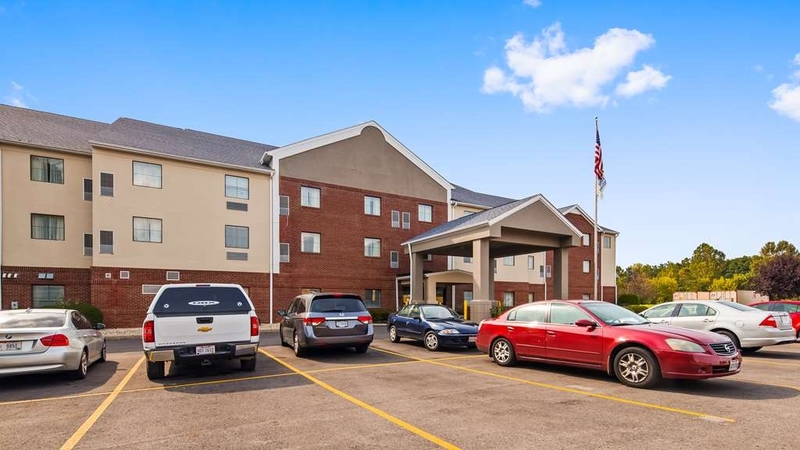 This Pickerington hotel features spacious, well-appointed suites with separate living area, each fully-equipped with cable HD television with HBO® and wireless high-speed internet access. Hotel guests are welcome to start each day with a complimentary full hot breakfast and wrap the day up with warm fresh cookies in the evening. Guests also can take full advantage of additional hotel amenities including an indoor heated swimming pool, fitness facility, full service business center and meeting space. Free passes to the Power Shack® Gym. 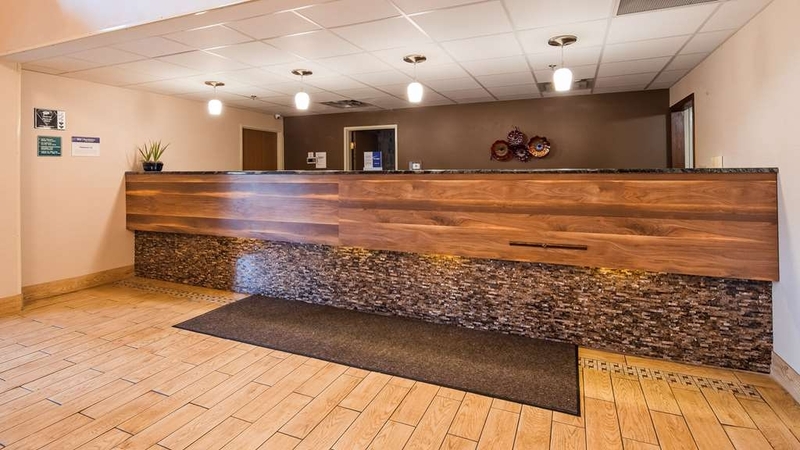 Visitors staying at this Best Western will find themselves close to a variety of local restaurants and shops as well as key area attractions such as the Rickenbacker Air Force Base and the Short North Arts District. Take a quick day trip into nearby Columbus to visit the Columbus Zoo and Aquarium or enjoy an afternoon game of golf at one of the many courses within five miles of the hotel. Corporate travelers staying at the hotel will appreciate being close to the Ohio State University, Department of Commerce, and the Columbus Convention Center. This hotel also provides convenient access to local events such as MOPAR®, the Ohio State Fair, the Arnold Classic and the Good Guys PPG. I stayed with my husband and son and we had a great experience. It was way better than we expected. Room was super clean, breakfast was good. It's a quiet place and bed was comfortable. Everything is nearby (restaurants, fast food, mall). An inexpensive place I would definitely recommend. Thank you for taking the time to write such a wonderful review about your recent stay! We appreciate the positive feedback about the hotel and surrounding areas. I hope if you're in Pickerington again you will choose to stay with us . Was very tired after a long drive and alone, otherwise would not have stayed. First observation was how dirty floor of elevator and hallways were. Fridge in room was plugged in but did not run. Toilet rocked on the floor, water came out of tub faucet but only a trickle out of shower head. Noise in hallway sounded like it was in the room. Worst hotel I have ever stayed in. Thank you for taking the time to fill out the survey, I apologize for not meeting your expectations. We are addressing the issues that you have mentioned and thank you for your comments. hard to find and get into, not at all good when traveling, girl who checked me in was indifferent, couldn't connect my wife's phone calls, didn't give me downstairs room as requested, and didn't greet me as Rewards member, I travel a lot and the points add up, strange room with dim lighting, but quiet, it is hidden behind a strip mall with no signage, coulda been a five, can it be that hard to find good help and signs? I go to Columbus to go to concerts the city offers. I drive up from Charleston, WV quite often. During this trip, me and my brother and sister in law came up to see Bob Seger. We only made our reservations a couple weeks out and it was very easy to do, plus, I even got a veterans discount. So to begin, I enjoyed this hotel stay. First, I liked that the hotel wasn't too close to the freeway so that the traffic would interrupt my sleeping. A lot of times, I request to be situated away from the roads when I stay somewhere. At this location, it's not an issue. It's not far from the interstate by any means, but it is away enough to achieve good rest. The breakfast was good, I had the various juices (strawberry kiwi, orange and apple) and biscuits with sausage gravy and an egg omelet. the food was very good in my opinion. The dining area was spacious enough and there's a TV there. Parking was ample for a hotel of its size and the hotel itself is very close to a lot of restaurants and stores. There's a movie theater close by as well if you're maybe staying awhile. If you're a movie buff, the TV package had plenty of movie channels available. I couldn't complain about the TV options. It was snowy while I was staying here, but the heat in my room was more than suitable. And the parking lot and roads around the hotel were plowed and passable. I honestly didn't see the vending options other than the pop machine right outside my room. But it was stocked with plenty of options. My room had a mini fridge, coffee maker, microwave and a TV in the bedroom and lounge. There was plenty of hot water and hygiene amenities (towels, soap, etc). I wouldn't have minded a plunger though since my toilet backed up on me the morning I left, it was no big deal though. All in all, I'd recommend this hotel strongly. I've decided, moving forward, in going to start staying at this location whenever I'm going to need a place to stay in Columbus. The only thing I can say would make this hotel even better would be if it had a mini bar with mojitos on offer, cheers. There may be newer properties with more of a real workout facility. This place offers large rooms that are clean. Mattresses comfortable. Walk-in showers. Free breakfast. Friendly staff. Typical free breakfast. Can also walk to Cracker Barrel and a good Mexican Restaurant. So is convenient to get in an out of since is in something of a cul de sac. Can get to Interstate and back easily. So really a good deal when all that is considered. No pretty and fancy but is that so important? The room was extremely overpriced. The paint on the walls was peeling. The heat was permanently set to 70. You couldn't use the pool due to it being broken and the area filled with boxes. Old furniture piled up outside window. The hotel staff is not very friendly or accommodating at all. The hotel is non smoking and my first room smelled so much like smoke I could stop coughing. The second room was better. My sisters room also smelled like smoke. The tub in my sisters bathroom wasn't working correctly and in ours it was just a dripping sound . But we could find were it was coming from. The staff in the area that they served breakfast was very friend and welcoming. We have stayed here the last 3 years around Thanksgiving. This was a disappointment. The staff were helpful. The water machine broke and they gave me bottles so I didn't have to purchase from the vending machine. Room was clean and spacious. Wish they provided an "upon request " breakfast menu for those of us that are gluten free and vegan. This was a good choice. My husband and I are careful where we stay. With family in Pickerington, we come to the Columbus area often. This is our home away from home. Everything here class "A". Would highly recommend. The hotel was in a great location. The workers were very nice. The king size bedroom was huge. I loved that they had a refrigerator and microwave. The only thing I didn't like was the smell of the room. It smelled like a old hotel. "Solid value, good for a night's stay"
Needed a hotel quick while in the area, stopped in, room was available. Was pleasantly surprised in hotel cleanliness overall, room was very clean, bathroom area as well. Only negative was that the outside trash bin was overflowing and trash had fallen on the ground right at the front entrance. "Not sure how I really feel about this "
Let me start by saying I have never been to this area before and made a reservation from an email for BW deals. I knew I would be passing thru and this was a good place to stop for the night. We arrived early evening and the desk clerk was prompt to assist but not overly enthusiastic. We had a suite on. 3rd floor which was great as I requested top floor away from the elevator. The room was clean but almost too big considering what was in the room. The bed area was nice. The sitting area was sparse for the amount of room available. At some point smoking must have been allowed because I could smell the residual smoke. The bed was fine and good sleep. The breakfast was as you expect from a BW, not bad, not great. As with any similar experience the host is what makes it enjoyable and this lady was very welcoming. She was hustling too. The check out was easy. I think this property would be best served with more and brighter lights in the halls. The landscaping was messy and grass and weeds needed attention. Enjoyed our stay at Best Western over Memorial Day Holiday. Breakfast was ok. Room comfortable and had microwave and fridge. Liked the separate sitting area with TV. Staff was friendly. Pool was out of service though. BW located within walking distance to Cracker Barrel, which we visited several times for meals. Close to freeway access, restaurants, movie theater, and Target. A little tough to locate, but navigation in vehicle got us there. Nice overall, friendly helpful staff. We will use again when in the neighborhood. Large room, close to highway, but quiet. Large number of restaurants in the neighborhood. Visited from South Carolina for my nephew's graduation from law school. The room was great, on the ground floor as requested, and had plenty of room. We had coffee, microwave and frig. The pool was down, so couldn't use it. The beds could have been more comfortable. 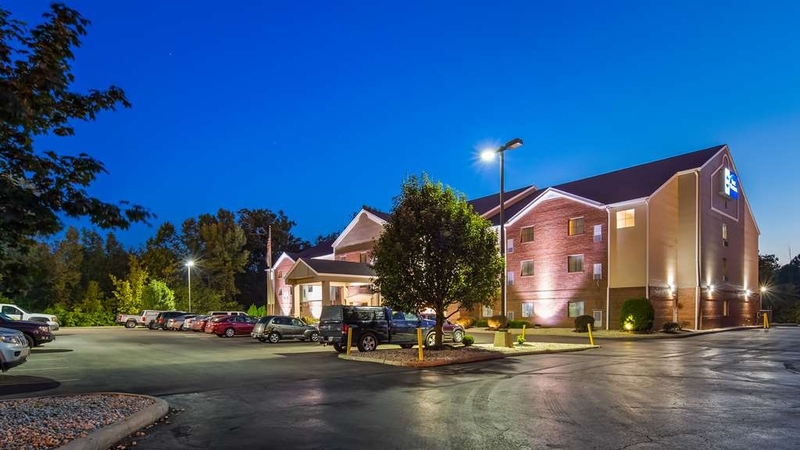 "Best Western Suites & Inn in Pickerington, OH"
Great hotel to stay at one night or multiple. Huge rooms, comfortable beds, great service! Everything was clean and neat and the internet service was excellent. I would love to go back and stay for multiple nights here. My wife and I stayed here for a couple nights while visiting family in the Columbus area. We were generally pleased..fairly large suite, building appears to be recently constructed, comfortable bed. There is plenty of food and shopping in the area. Cracker Barrel and a Mexican restaurant in close walking distance. If we had to do it over again, would probably request a room on the second floor, because it was quite easy to hear the folks in the suite above us moving about, and they were not running or stomping. Also, this Best Western is close to the interstate...you can hear traffic moving, but it wasn't to the point of affecting our sleep. Overall, good experience! "Average Hotel But Great Employees"
We stayed at this hotel while college campus visiting. The hotel and it's amenities were about the average of what you would find. When we first arrived, they were fixing the only elevator. However, it was not a big deal since the hotel was only 3 floors and not that big. We easily got our luggage to the 3rd floor and the elevator was working the next day. What was helpful for our stay was the staff. There were a number of guests on the 3rd floor that apparently knew each other and would go to each others rooms, slam doors, and yell loudly in the hallway making it difficult to sleep. We finally called the front desk and the staff tried to resolve the situation. We did notice less noise on the 2nd night and it was much appreciated since we had a 6 hour drive back home the next morning! There was a separate sitting room and comfortable v\\beds with convenient chargers. Parking was easy and the breakfast was outstanding. There was plenty of bacon and a variety of pastries, The woman in charge of breakfast was very friendly/ A newspaper was provided for every table. Hotel was clean and comfortable. Had not stayed at a Best Western in quite some time and was very impressed with the upgrades. I had no issue walking in and booking the room without a reservation. Staff was very accommodating to give us a room on the first floor. Spacious room, nice location, quite easy to find the right place. everything was layout clearly and easy to find everything I need. It is also easy to find gas station nearby. Though arrived at here quite late, the staffs are here. My husband and I stayed here for our anniversary. The hotel was clean and reasonably priced . But the other guests were so loud. My husband and I barely got any sleep. There were a ton of kids just running around. And it was like they were up all night jumping around. I get that is not the hotels fault for the the craziness but I wish they would have contacted the other guest to calm them down. I am a mother of five kids so I do understand how kids can be but to be up all night and romping around. It didn't help the walls were thin so it made the situation worse. I would recommend this hotel if it isn't busy. Cheapest hotel I could find within driving distance or school event. Rooms were nice and spacious. Students liked the setup. The staff was nice and friendly. The breakfast was okay. Nothing overwhelming. Mostly average. We made a last minute trip to Columbus for a funeral. The services were on the southeast side of the city so in looking for a hotel I wanted a nearby location with clean affordable rooms. The reviews were good for this Best Western and the price couldn't be beat so I booked it and was not disappointed! The check-in staff were very friendly and accommodating. The room, which was a suite, was clean and comfortable. It had 2 flat screen tv's with Directv and a comfortable king size bed. There was a microwave, small refrigerator and coffee maker, an iron and board as well as a hair dryer in the bathroom. Plenty of very hot water in the shower as well! The morning breakfast was adequate and more than expected for such an affordable price. Bacon, mini-omelettes, potato's and waffles on the hot side and bagels, bread, yogurt, cold cereal and fresh fruit on the cold side. The hot dishes are chaffing dish style, pre-cooked and help yourself style. Juice and coffee as well. Lots of shopping, stores and restaurants nearby as well. We would definitely stay again! "Average service with nice rooms"
"On the road again part 3"
Clean and reasonable. Pool was not available and the property is a little tired. It needs to be freshened up. Could hear people in other rooms, both conversation as well as the noise from their shower/toilet. I had an enjoyable stay at this best western. The staff was friendly and it was in a nice neighborhood. The motel was clean, WiFi was fast, plenty of TV stations. Breakfast looked like a typical motel breakfast. I'll stay here again. We have stayed here several times and it is a very pleasant stay. Room is comfortable and clean and the breakfast is excellent. The hotel is tucked away but there are several shopping and dining areas near by. Nothing fancy, but good value...mattress was not the most comfortable. Staff was friendly and very helpful. Location made it a bit hard to find, but it was close and convenient to all the area had to offer. This was such a nice and quiet hotel, and a super value. We were originally scheduled to stay one night only because this hotel is close to the airport, and on the way to The Wilds. We decided to cancel our other reservation for a hotel close to the Columbus Zoo and stay here 2 more nights. Even though it was a farther drive to visit the zoo and family, it was worth it. It's so seldom we find a nice, quiet hotel at such a good rate. We've stayed in hotels traveling the US and abroad about 34 days in the last year. This hotel rates at the top for value, quality, and service. "Good night's sleep at at good rate." Starting to show it's age but the rooms are priced competitively. The large room with 2 TVs and a hot breakfast was great. I stayed for business but would consider coming back if I needed to stay with family. Plenty of places nearby to eat. Traffic can be troublesome since it is a popular exit. Thank you for your kind words. We are pleased that you enjoyed our all suites hotel and hope that we will see you again soon. When I checked in the staff was unfriendly and not at all helpful. Same experience when I checked out with a different staff member. Additional charges are now showing up on my card after the room was prepaid. Sorry for the experience you had with the team members. We do understand you prepaid, but third party reservation do not pay for the risk associated of renting out the room. Say you decide to smoke, party, damage the room or litter it with confetti etc. That's the reason we take your card to authorize for incidentals, that is done for each and every room you rent. This incidental is just an authorization on your card and does revert back in 3 to 5 business days after checkout and at no point we get to hold it, always stay with your credit card provider. I do understand you felt offended by this and decided to give us one star, but this procedure is followed industry wide, we are not the only one doing it. Front desk was just following management instruction and fulfilling his duty. I hope you will understand and remove the negativity in your heart and hope you will be back to stay with us by giving us another opportunity to serve you better with a smile. I would even like to take the opportunity to wish you best for the holidays and prosperous New year ahead for you and your family. Had a restful night's sleep while driving from Chicago to DC via Columbus. 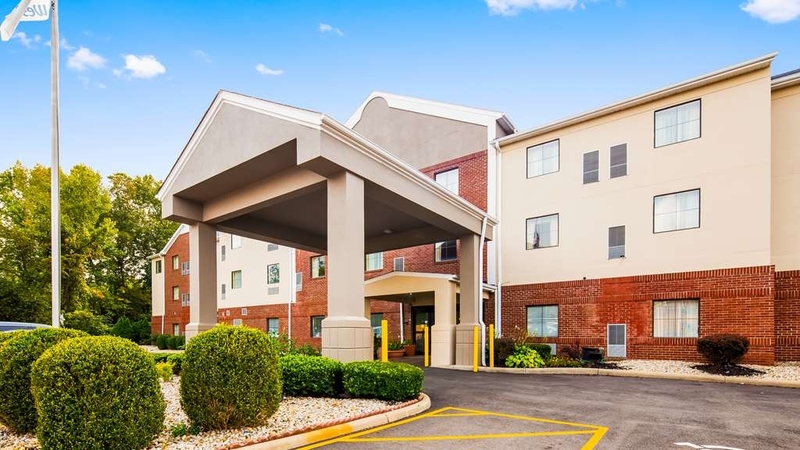 BW in Pickerington has a nice look and feel with spacious, comfortable and quiet suites. The breakfast was very convenient and the staff was courteous and efficient. All in all...a nice spot to rest enroute. Instantly had problems checking in due to staff that spoke poor English and had a generally overall rude demeanor. Breakfast was fine but didn't start until 6:30 which ishould a little on the late side compared to most hotels. Mr. Jason we sincerely apologize for issues you had at check in. We are reviewing the issue and will retrain the staff. Thank you for taking your time and reporting the issue to us. We had a delightful time staying in our suite. The staff was very friendly and the room was very spacious. The location is close to many popular vacation sites. I will definitely stay here the next time I am in the area. Thank you for letting us know about your stay with us. I will pass along your compliments to our staff and let them know about your stay. We are looking forward to your next stay. So many issues during our three day stay that I had to rate this facility as one star. It started out that the room they tried to give us smelled like an ashtray full of cigarette butts even though it says that it is a "smoke free" facility. The next room they gave us had a broken hvac system, no heat. It was quite cold the next morning when we woke up, temperatures outside in the 30's. We informed the front desk and they told us maintenance would take care of it while we were away during the day. Upon return, still no heat. So we had to get another room, this one having not been cleaned thoroughly as I found a broken pierced earring on the bathroom floor. I'm glad iI didn't step on it and puncture my skin. Two out of three days the breakfast buffet was out of breakfast pastries. The attendant informed us that only two dozen pastries are put out and when they're gone, they're gone. This was on the OSU/Penn State football game weekend. She also began to shut down and remove the buffet items while guests were in line to get food. This was before the 10 o'clock closing time as stated on the signage. I couldn't believe it! We went to the pool, and there were no towels. We called the front desk and they promised to bring them. 1/2 hour later, nothing. Had to go find towels myself, dripping wet through the hallway from a cleaning cart. Upon checkout, we were incorrectly overcharged almost $60 more than the confirmed quote that we received when we booked online. The clerk, dressed in a sweatsuit made the correction; how professional. After filling out a Best Western survey about our stay, the manager emailed to say "We're sorry we didn't meet your expectations". You Didn't Even Come Close !!! Never going there again. We sincerely apologize for the inconvenience and we do feel you had a unpleasant stay and had to move 2 rooms, to finally get one which was in perfect order. At times these unfortunate incidents do happen but we have a friendly staff and they are their 24 X 7 around the clock to assist you and your family in such situations. A great place to stay. Management is very helpful. The suites are large, with many amenities. Breakfast is available, with a good selection of hot or cold breakfast items. I would suggest this hotel to anyone traveling through Columbus, Ohio. We are so happy that you enjoyed your recent stay in our suites. We have recently gone through a renovation so we are glad that you could see our new rooms. Please return again soon. if you don't care about having a place to put your soap. or walking across the room dripping wet to grab a towel, this is the place for you. bed sheets are not fitted so come loose. the bed it self sags. there were nasty looking marks on ceiling above the bed?? Check in staff mostly grunt questions and answers, will not make eye contact. Same with check out staff, and i was wearing a suit and tie and am know for being pleasant in the worst situations. I will never come back. We sincerely apologize and would like to address your concerns. Firstly you had a handicap room which was with a roll in shower. Definitely the bathroom is designed for people in wheel chair and not for a regular person, I hope you understand that. Ceiling had slight imperfection due to added popcorn patch but had no stains. I have addressed and retrained the staff to be more polite, make eye contact. we do use flat sheet as we use triple sheeting on the bed and mattress already has fitted mattress pads and a cover under it. Thank you for letting us know about your recent stay. We are so happy that you are a Best Western Rewards member and hope that you will stay with us again soon. Our sincere apologies for any inconvenience you had with your stay. We extremely take note of all our customers grievances at same time would not want to fall for a blackmail. Our policy is very clear and you know it well too. You did not report anything throughout your stay except at check out and still we did our part. "Nice place to stay in Pickerington"
This was a nice hotel. Better then then others around. It was clean, rooms spacious, staff was friendly and helpful. They had recently renovated their guest rooms so had brand new furniture, carpet, sofa, mirror, artwork and drapery. In general had a great stay without any trouble. Had quite a choice of eateries around almond with a spa saloon. Nice, end of a dead end street with trees so it was quiet (considering I could see the highway from our room), well-lit parking with adequate spaces, good breakfast (waffle maker was a hit), staff was nice. Thank you for staying with us. We love our location next to a lake, giving the option of quiet walks in a suburban location. We hope to see you again soon. We have stayed in this hotel many times for various events that we attend..... The staff has always been great.....the hotel itself is clean and never have encountered any issues....cleanness is a must and i recommend this place!!!!! Thank you for completing the survey regarding your recent stay at our property. Your business is very important to us and we value your feedback. By telling us what you liked about your stay and how we can improve, you are helping us deliver a superior experience for you and other guests in the future. We hope you will come back and see us again soon. If I can be of assistance in the future, please don't hesitate to contact me at 614-860-9804. Thank you again for taking the time to complete the survey. We appreciate your loyalty to our brand. We use this hotel often if we are on a multi day drive. It's a nice location, right off the interstate. We are never there very long but enjoy the large comfortable suite. The bed and pillows are great. Bathroom could use a fan but otherwise it is a larger than some bathroom. We will continue to stay overnight here in the future. Staff was caring. Property looks well kept. Housekeeping did a good job . of charcuteries. Like the Suite. More space to move around. Nice Breakfast choice . Br akfast attendent was good. Interacting with the guest. Restaurants & movie Theater close by. Stayed here for 3 days and room was comfortable, clean and quiet. Hotel lobby very nice with friendly staff at front desk as well as cookies at night to go to bed with, NICE! Is kind of off the beaten path but with a GPS not hard to find! Although this is an older facility, care has been taken to upgrade the essential content. The staff was extremely friendly and helpful and make this an enjoyable stay. As with any older facility there will always be room for improvement but the apparent enthusiasm exhibited by the staff easily offset any minor concerns. Thank you for letting us know about your stay. We are glad that our staff treated you well and we hope that we will see you again soon. "bug i room and noise"
We apologize for the difficulties that occurred during your stay. We pride ourselves on offering a relaxing atmosphere at the hotel so we are disappointed that there were so many things seem to go wrong. We hope that you will give us another chance. Plus, the hotel is WAY back in a weirdly isolated road from the interstate and local roads. We called the hotel directly vs the 800 number to be assured we could be on the same floor as our disabled mother. We were not, and were not accomodated. Thank you for your review. The weekend you stayed with us was a high demand period with the surrounding hotels sold out. We actually offered the lowest rates in the area for a mid scale hotel. As you travel, you will find that most hotels have removed safes as they are unreliable. We apologize that there were not more towels in the room but we are more than happy to provide as many towels as you like. I let our maintenance staff know about the wasp nest as our landscaping service obviously missed it. We are a completely non-smoking hotel so it is frustrating that guests smoke in the room. Thank you for telling us about your stay. We apologize that we didn't have another front desk agent working to shorten the wait. We are pleased that the hotel felt like home. We hope to see you again soon. "Two Rooms Does Not A Suite Make"
Despite spacious rooms, this is definitely a bare bones hotel. Furnishings are sparse and of very low quality. With the exception of good orange juice, breakfast was typical of low-end extended-stay hotels. Fortunately, our room was on the upper floor, because whenever we were on a lower floor we heard every step taken above us. We did not hear much noise through the walls but voices carried quite well through ventilation ducts. I would not choose this hotel again. We are sorry that your experience was not up to our high standards. We find it interesting that the description of the rooms are sparse and similar to a low end extended stay hotel. Having worked in that industry for over 20 years, I would hope that this is not true since most extended stay products offer a muffin and coffee and we offer a full breakfast. In addition, in the past few months, we went through a renovation so our furnishings were replaced. Based on your comment about floor noise, it seems you have stayed with us before on the lower floor. We have not had complaints about floor noise before so , again, we are concerned about your review. Also, since ventilation systems are standard, per code, in most hotels, I would expect you to hear the same in other hotels. As you say that you will not stay with us again, please accept our best in your future travels. The rooms were clean and organized. The pillows smelled of body odor, which means they have not changed the pillows in quite a while or they did not change the pillow cases before I stated. Overall the facility is clean and I def will stay again and recommend this hotel. Thank you for letting us know about your stay. I apologize that the pillow cases did not reflect the cleanliness that we expect. I will check with our Housekeeping staff to see where we might have failed. "Nice space but not much more." Like the suite space for the price. The breakfast has a nice variety. Some staff are less than eager to be of any assistance. Would probably stay there again, hoping that the staff become more attentive to the needs of the building and the comfort. Thank you for your comments. I am concerned about your comments about our staff and would love to learn more about your experience. I would be happy to speak with you directly if you like. Thank you. Staff were fast, efficient and pleasant. Room was clean and I think recently remodeled. I had asked for a 1st floor room when I made the reservation and they marked one for me. This doesn't always happen so I was great full. I would stay here again. Thank you for letting us know about your recent stay. We are glad that we could accommodate your request and hope to see you again soon. This suite was larger than I expected with 2 TVs, one in the bedroom area the other in the sitting room. The king-sized bed was very comfortable and plenty of hot water for the shower. It was nice having a microwave if needed and mini fridge in the room for extra bottled drinks. Thank you for your comments and review. We are pleased that you enjoyed our larger suites and hope that you will return to visit again soon. "Reasonably priced, can be better"
The price is pretty reasonable which is a plus. However, facilities are kind of 70ish, definitely can use some update. The breakfast is quite poor to be honest, we opted to go to Bob Evans after staying for a couple nights. Thank you for letting us know about your recent stay. We had a recent renovation for much of our hotel so we hope that you noticed that during your stay. I will pass along the information to our breakfast attendant and make sure that she puts out more options on busy times. Hotel was very clean and everyone was super nice! We were surprised on how big the room was and how clean it was. The person at the front desk was helpfu! The breakfast was nice and hot I alway love making a waffle. Thank you for your kind words and for staying with us. We are pleased that you enjoyed your stay and our staff was able to make you feel comfortable. We hope to see you again. This hotel was outdated, dingy and dark. The walls were thin, so you could hear everyone around you. We only chose this hotel because it was close to Pickerington Village and the Hampton Inn next door was booked. Definitely not worth the price we paid. We will try not to stay here again. Thank you for your advice and opinon. I stay at this hotel a lot and I always get a very clean room, friendly staff, and pleasant stay for a very reasonable price.The grounds are always well kept. There are a great variety of resturants nearby. We always try to stay at Best Western's because of the ride rewards program. This BW was over priced. The rooms appeared old and could hear people in room next to mine all night. We got a cheaper rate with Internet coupon than ride rewards card. Internet service was poor. "Nice and clean for price"
I barely left the room and maid made the room clean in a few minutes! Loved her quickness! I liked the comfort and location. We were able to have two separate areas and a long counter! The family came for a Wedding! We received and excellent group rate. The people who worked the evening shift were very rude! The eggs were awful! We were glad that you and the family were able to stay with us during the wedding. We appreciate that you and the family decided to stay with us. We hope that you will stay with us again if you are ever in the area. We stayed in this hotel for 6 days while flipping a condo in Canal Winchester. We needed an inexpensive place to lay our heads after a long day of hard work. This hotel is a hidden jewel. It is in a great location - within walking distance to a Cracker Barrel and La Fogata a Mexican food restaurant. It is somewhat hidden behind a few restaurants. This is by far the cleanest hotel I have ever stayed at in my life! This hotel is a hidden jewel. It is clean, quiet, well kept and is a great place to stay if you want a quiet place to rest. The breakfast was good, nothing fancy, but kept clean with hot and cold food. You are not able to take the food out of the eating area however. The hotel has a nice indoor pool and a small workout room. The front desk staff are professional and knowledgeable, while not always the friendliest, they are not rude at all. Overall, this hotel is excellent. We will stay when we return to the area. Thank you for your kind words about our hotel. We were pleased to have to stay with us and we are glad you enjoyed your stay. We hope to see you again soon. "No parking and poor service in processing check in"
When you pay from the room online, add two more days I shouldn't have to deal with an experience front desk. When returning from local event, I dropped my son off only to find out you guys needed another I d that matches a card we used the pervious day. Plus, all the little line items for need initials by them you think from the get get go you will add charges no matter what. We apologize for the misunderstanding about extending your stay. The first portion of your stay was through a third party site so to extend your stay, we need to additional information. We need the person who made the reservation and signed the paperwork when you came in to extend the reservation instead of someone else. As for the initialing items such as check-out date and other items, unfortunately in the litigious society we live in, we need to make sure that both parties are aware of the information that is pertinent to your stay. We hope to see you again soon. Thank you for staying with us. We are pleased that you enjoyed your stay and our mini suites. We hope that we will see you again soon. Have stayed at this location in the past and have never had a problem until this trip. Front desk didn't now what they were doing. Called two hours prior to arriving and let them know I'd be late and verified my reservation, when I arrived they told me the room had been given out the previous day. Luckily they had an open room (actually several) Became very snippy not only with myself but with another customer. Next time in Pickerington will go elsewhere. We apologize for the misunderstanding regarding your reservation. I will work with our Front Office manager to find where we fell short. We appreciate that you are a loyal customer and hope that you will give us another chance. 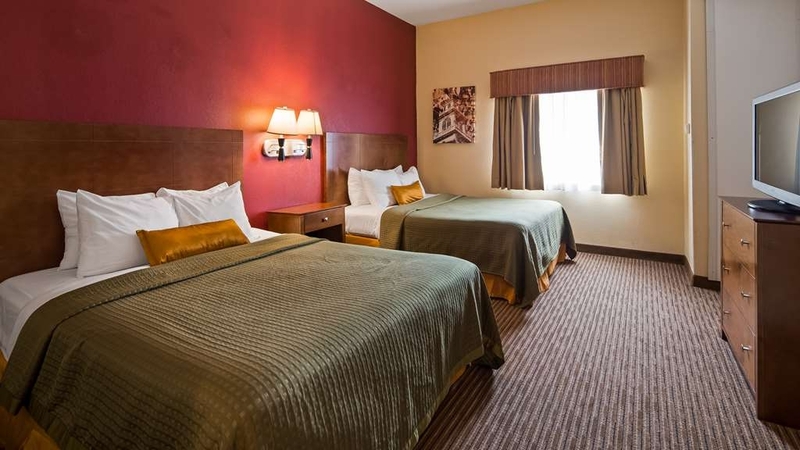 "Very friendly staff, newer hotel, and one of the best values in the area"
Three of us stayed here for Friday night and Saturday night for a weekend youth baseball tournament. Despite all the chaos with having many teenagers around, the staff was quite polite, gracious, and accomodating. They helped us tremendously to get very comfortable sleeping arrangements for all three of us. The free breakfast was run-of-the-mill, but it tasted good, was hot, and was fresh. Thank you for your kind words. We are pleased that you enjoyed your stay and hope that you and your friends will return soon. Outside of building is deceiving, room has a smell and poor desk service (attitude) Lots of room in our King size room and outside looks updated but other than that is the only positive. Looks like they are trying to update which is good with effort. Can't have breakfast before 6:30 which doesn't help when you have to leave at 6. Usually hotels let you get cereal before you leave but the lady working in kitchen was upset if you take what was out before 6:30 which seemed rude and doesn't make sense. 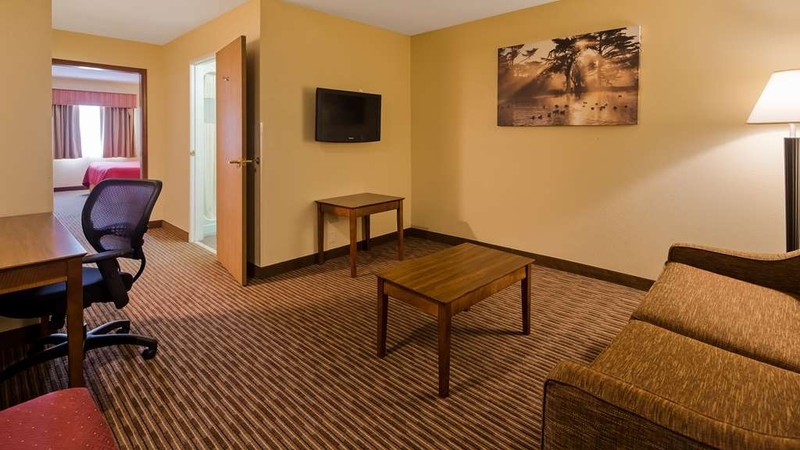 The rooms at the Best Western Executive Suites - Columbus, East - are very appealing. For a busy executive, who wants a wind down, this Best Western offers a fitness room, pool, outdoor interests, and spacious rooms. For family travelers, who need some space for children or extended family, the fitness room, pool, outdoor interests, spacious rooms offer side attractions for all without crowding. 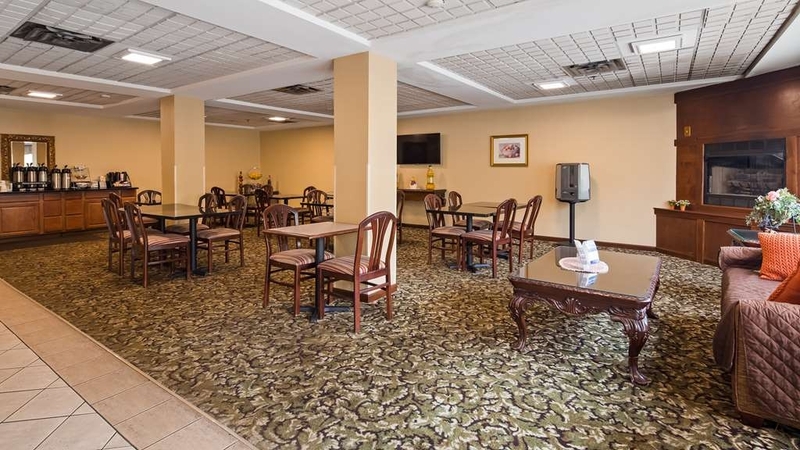 The Best Western Hotel building has a nice breakfast dining area that is accessible for all. There are two lobby areas, first floor and second floor, that offer gathering space for families or groups. Additionally, there was a small conference room on the first floor, near the fitness center. Thank you for leaving us such a detailed review. 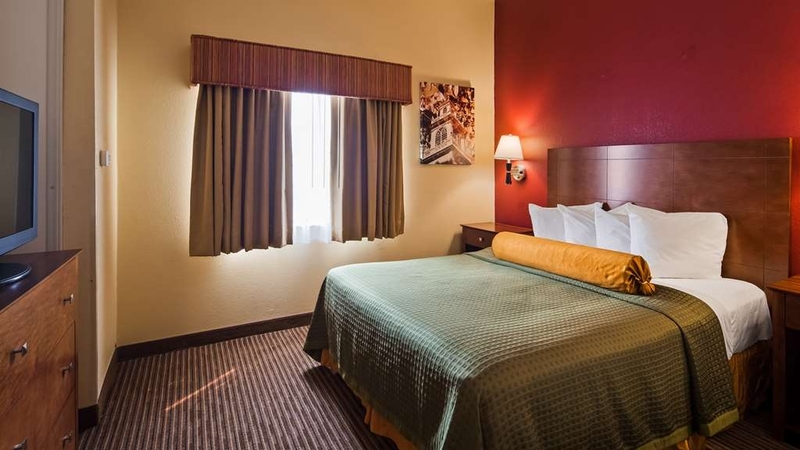 We find that all of our guests appreciate the extra room that our all suites hotel offers. Business people love the area to spread out and families love the extra room for the kids. Please stay with us again soon. I really didn't need a hotel experience with all suites as it was a quick overnight stay but it was nice to have the experience. I took advantage of the "living" area to unwind and check emails and watch some TV before moving to bed and watching a little more TV on the timer. Not "elegant" but had more of a business feel and was a nice place for being on the outskirts of a large city. Thank you for choosing our all suite hotel for your recent stay. We agree that it is nice to have the separate sitting area to spread out and relax. We hope that we will see you again soon. Check in was fast and professional. Got good room was pretty large with seperate living and bed area. Breakfast was good. They also had single cup coffee maker which I liked but would have preffered keurig. Staff friendly and good highway location but tucked way behind. Thank you for letting us know about your recent stay. We are proud of our all suite hotel which give our guests extra room to enjoy their stay. We hope that you will stay with us again soon. Just had a wonderful stay at Best Western Pickerington Ohio. The rooms were spacious. Staff was friendly and helpful. Everything in the room was clean and immaculate. Had no problems at all.Very close to downtown Columbus, with lot of places to eat around. Thank you for your wonderful review of our hotel. We are so happy that you enjoyed your stay and hope that you will return again soon. Thanks for the review. It really means so much to all of us at Best Western Executive Suites - Columbus East. We have even acknowledged your dislike of our breakfast and management and breakfast staff are already discussing to see how we can make it better. Please feel free to give us a call and let us know what precisely you want us to do that would help us make it better. I'm a AAA member, needed a room ASAP. Very afforable and the process was fast. Staff was nice. Only complaint was not being able to hook up HDMI cord to the TV to be able to watch movies on my laptop. Thanks for the positive feedback. It really means so much to our team to know you had a wonderful stay at Best Western Executives suites - Columbus East. We did notice that you were not able to hookup your computer. Next time you are here please ask the front desk for the master remote and they will be happy to give you one. As per our Best Western Standards we are only allowed to put in Clean Remotes in all guest rooms, as they can be cleaned easily and considered most hygienic in the industry. "Comfortable, clean but not very enthusiastic desk staff"
Everything was great! Loved the extra counter space for preparing food. My hubby enjoyed watching sports on one TV while I enjoyed my own programs in the bedroom. No issues, no complaints. Highly recommend this location! Thank you for the great room and great service! Only wish we could have stayed longer! Nice Friendly Staff, clean rooms, nice breakfast and convenient travel to surrounding restaurants and shopping. Just be aware that showers in room (not sure if all rooms were remodeled this way) is limited to guest size. A tall person or fuller figure person will either not fit or be a bit uncomfortable. Other then this, I recommend! Nice quality for the cost! "Smoke scented room with hateful staff"
The location of the hotel is very difficult to find. The staff at check in were pleasant. The hotel is under much needed renovation and the rooms have the lovely aroma of smoke and mildew. The room was very large but very outdated. Breakfast was decent. Front desk staff were very pleasant and accommodating. We were told from the front desk staff we could sit in the breakfast area during lunch since we were there for a conference. We were greeted by a rude and hateful woman telling us we couldn't be in there due to hotel policy. We told her the front dest said we could. She then changed her story that it was due to health code reasons. Then told us it was because she just cleaned. I would suggest spending your money at the Hampton Inn across the street. We do understand that you were disappointed with the breakfast staff. The health department does require us to have the food area clean at all times and that's why we do not allow guest to have food, as you might have seen a GOLD Award certificate hanging out there. You are most welcome to sit there and have coffee though. We do apologize for the the feeling you'll got from one negative interaction and since then we have discussed and retrained all the team members. We want to be the BEST in hospitality and hope to see you'll soon. This was a time to celebrate my wife's 54th birthday and enjoy the weekend with family. Our grandkids enjoyed themselves especially at the pool and at breakfast. My in laws came up to visit and enjoyed it so much they tried to book a room but the hotel was completely booked. They were disappointed to say the least. "Huge Rooms, Very Clean and Comfortable"
Our paintball team stayed at this hotel recently for a tournament and were extremely satisfied with our experience. The rooms were clean and very large, which made for team meetings and hanging out very comfortable. The breakfast was fresh and very tasty, the showers were hot and the fridges were cold. The staff were always smiling and visiting with us about our day. We will definitely stay here again. Thank you BW for making our stay so enjoyable! Reservations for 2 nights and after first night had phone call asking when we were going to check out ! Then had to re-register just to get back in our room when we were in a hurry to get to conference! Amazing staff, beautiful room, worth the price. 10/10 would recommend. Will be reserving a return trip in July for a couples getsway. Very excited to return to the best western of pickerington. Thanks for the awesome time! Things went smoothly. I enjoyed the room. The bed was extremely comfortable. Staff was friendly and helpful. Pleasant environment. Would recommend it to family and friends. The room and hotel in general were very clean. Thank you for your kind words. We appreciate that you stayed with us and that we could provide a comfortable experience. We hope to see you again soon. The room space was awesome, as were the staff. The only com[plaint I would have regards the faint odor of smoke during our stay. The light switches were hard to find and the remote did not work properly. There was also a lack of reading material describing the area, as is commonly found in hotels Hotel is hard to locate!! Thank you for letting us know areas we can improve on. I will pass along the information to our housekeeping staff so that on your return stay, you will have a perfect and relaxing time. "Don't come for the pool"
Great hotel with the exception of the pool. It was small, over chlorinated, and we found a couple bugs in the water. The rooms were spacious, and nice. The staff was friendly. Breakfast was average. For the price, we got what we expected. Thank you for letting us know about your stay. We are sorry about the bugs int he pool. We will have our maintenance staff check regularly. As we are in a heavily forested area, this is something we monitor regularly. Please return soon. Very nice third floor meeting room. Good lighting, both overhead and natural through several windows. Very good temperature control through two units. Overall peaceful and quiet being at the end of the hall. Also pleasant to look out windows to wooded areas and a pond. Ample comfortable seating with tables. Appreciated podium and dropdown screen. The manager, Mike, was professional, cooperative and a pleasure to work with. As was his staff. The adjacent hotel room we used was clean and comfortable like other rooms we've rented in the past. Thank you so much for your kind words and review. We love our location among the woods and are pleased that you enjoyed it as well. We hope to see you again soon. "Decent stay, peaceful location "
Stayed one night, room furnishings are slightly run down by today's standards, but I knew that going in, so I wasn't surprised. Hotel is near Blacklick Park bike path. Highly recommend. The jacuzzi tub was great and very clean. Huge with forceful jets! King Suite was nice to have room to spread out. I'd recommend requesting top floor so you're not disturbed by guests walking around above you. Breakfast looked good. Price was a little more than I thought it should be due to the fact that hotel needs an upgrade, but overall good. Try LA Fogata restaurant nearby. Thank you for letting us know about your recent stay. 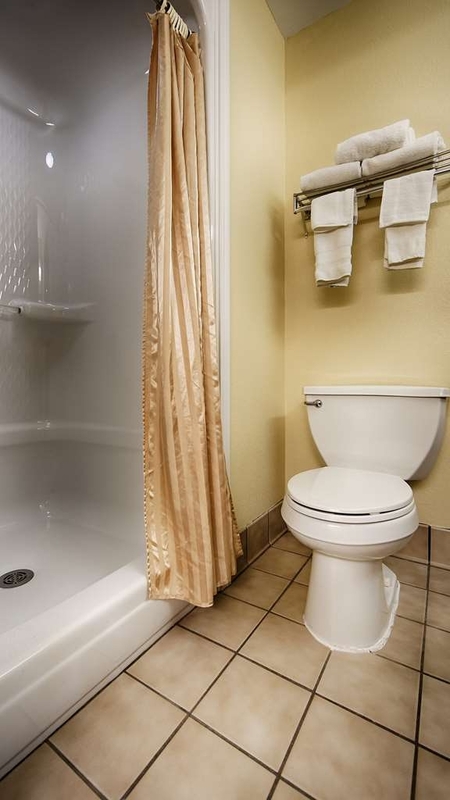 We are please that you enjoyed our Jacuzzi suite and our location. We hope that we will see you again soon. I had an issue with an incorrect room charge, and Kairee immediately took care of it. He was professional and easy to work with. Thank you! Very responsive in his manner, and very professional. Thank you! We are so pleased that we were able to resolve your room charge issues to your satisfaction. We all make errors but our goal is to learn from our mistakes and resolve the error with empathy and understanding. We hope we did so in this case. Thank you. Nothing special stood out. Room noises from other rooms and halls made it very uncomfortable. Breakfast selections were limited. Good selection of restaurants were within walking distance of the hotel. Thank you for letting us know about your recent stay with us. I checked your reservation and found that your stay was during a busy weekend with many events in the area. We definitely try and help our guests respect others need for quiet. We will review our procedures to see if we can improve our response. Thank you. "Review of Best Western in Pickerington, OH"
Hotel showed its age. Breakfast was sparse. Service needed supervision. Hotel run on a shoe string and it showed. I was happy to leave. If I did not arrive so late, I would of looked for another hotel. I have used Best Western on many occasions, but this location was the worst that I had experienced. We are sorry to hear that you did not enjoy your stay with us. I will be happy to drill down deeper to see where we fell short as most of our guests enjoy our all suites hotel and our upgraded breakfast. We recently renovated our breakfast area so we are proud of the changes we are making. I know that arriving late after a long day of travel can be very stressful so we apologize that everything was not perfect on arrival. My mom, dad and I are traveling together for a week. We stayed here two nights. The room itself is nice. A living room with sofa, tv, desk and chair. Bathroom is ok not fantastic. Bedroom I had a king bed which was comfortable and a tv. The problem with the place is it needs updating. All the carpets and sofas. The hotel is clean and has good wifi. Breakfast is pretty good but they don't want you to take it out of the room which is weird. Thanks for letting us about your recent stay with your parents. That sounds like so much fun. All of our rooms are suites so you do have extra room to enjoy time with family. We are making plans right now for our renovation so we hope that when you come through the area again, you will stay with us again in our new rooms. We stayed here for 1 night in September and all our expectations were met. Restaurants near by is also a plus. Easy access close to the interstate. Always ask for a top floor room to help with noisy neighbours etc. Thank you for telling about your recent stay. 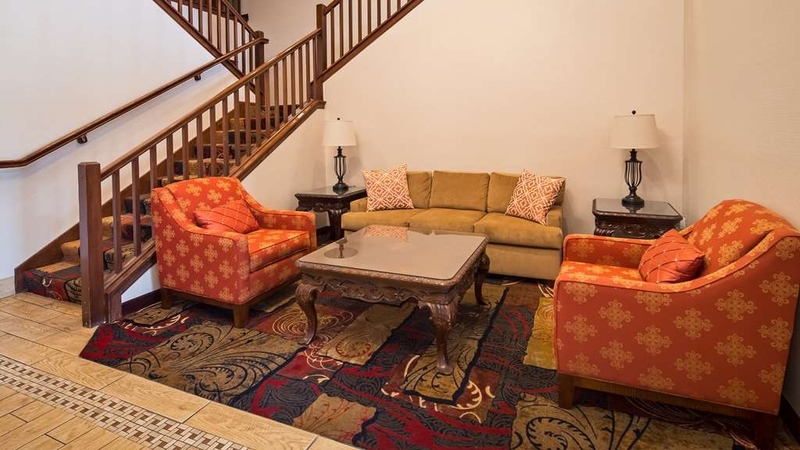 We're happy that you were able to enjoy our amenities and the surrounding restaurants. We hope that you will return soon. I was truly disappointed in this hotel. Having brought two teenage girls with me I had made reservations for two suites with jaguizzi and had explained that because of a functin we were going to needed an early check in which I was told they could accomodate. When wer arrived at noon I was told that we could not check in until 3PM. The young woman at the counter was very dry. I told her I would like to cancel the reservations and would attempt to find another hotel in the are. She informed me that I would be charged for the rooms anyway. When I asked to speak to Manager a young gentleman came out and gave us two rooms that were available but did not have the amentities I requested. Needless to say the two rooms give were musky,the pool dark and dingy and in the morning the coffee urns were empty. My kids were disappointed and so was I. So sorry we were not able to take care of you. We were sold out and the housekeeping was trying its best to accommodate everyone too. But at times it gets little challenging and are not able to fulfill all the requests. Once again we apologize for not being able to fulfill your request and we will retrain our staff to deal more appropriately with the situation. The rooms were clean but the breakfast was inedible (9/24/16, according to my party & others there), the front desk staff were not very attentive or helpful, & the fire alarm was too quiet - dangerous. We sincerely apologize for the breakfast, but really would love to hear some more specifics of what you did not like. Please call me at 6148609804 and we will try to alternate those products. Fire alarm was taken care for really fast as most of the staff were present and since it turned out to be a false alarm we were able to silence it, giving a wrong impression of "being too quiet". Despite calls to the hotel ahead of time to ensure that the room would be ready for me and wheelchair accessible, it was not set up as expected. The design made it impossible for me to shower, use a lamp, or reach the iron or hair dryer. Don't believe them if they tell you that a room is wheelchair accessible. We deeply apologize that an accessible room was not available on the night of your arrival. I checked to see what was available on your date of arrival and unfortunately, the hotel was sold out and our accessible rooms were occupied by guests. Our accessible rooms are the last we sell on each night. I expected a really upscale BW since it is an Executive Suites BW. It is not. Needs a total refurbish on the rooms. The carpet was sticky. Had to wear flips to walk around the room. Would not sit on the sofa. Have seen cleaner and in better condition at the Salvation Army store. Just slept and got out. Spoke to the manager and she said they are scheduled to replace the carpet and furniture in a few months. Stay away till then! On the upside Roberto at the reception desk was very nice and efficient. We apologize that your visit was not up to our standards. I will check to see what room you stayed in so that we can check to see where the issues are. We receive few complaints for our all suites hotel so I with make sure that we investigate why your room was not in the same condition as our other rooms. The good news is correct, we are expecting to start our renovation in the next few months. I rode out to Pickerington Ohio to visit the AMA Motorcycle Hall of Fame and the hotel was only half a mile from the museum. I arrived around 12 noon to just check my reservation however check in time was a 3pm. I told them I would return later and but they checked me in and gave me my room immediately. The staff was very friendly and went up and beyond what I expected. Took the time to get fresh donuts for breakfast along with everything else available. Motorcycle parking was a plus along with the clean room, plenty of towels, good WIFI, I was very pleased. Thank you for letting us know how your stay was. We are glad that we were able to get you in your room early so that you could begin your relaxation. Please stay with us again soon. Excellent overall hotel..... Nicole the manager was a pleasure....... clean and accommodating.....The breakfast was very good ....fresh coffee... and the entire staff was helpful.. The pool was clean and refreshing...adequate towels in the pool area. I would recommend this location. Very excellent experience. Thank you for letting us know about your recent stay. We are proud of Nicole and our staff and are pleased that they were able to make your stay memorable. Please pass the good word along. Please come back soon. From the front desk clerk at check in (Maggie) to the front desk clerk at check out (Chris) the service couldn't have been better. Smiles all around and full of useful information. Room was very clean and comfortable. We are so happy that Maggie and Chris made you feel at home and you enjoyed your stay. We want each of our guests feel happy and comfortable and hope that you will return soon. wasn't expecting much for the price we got the room for, but boy were we surprised!!!! Walked into lobby and very classy layout and when we walked into the room we were blown away with the size and decor. Breakfast was very good and the area was kept very clean. We will definitely got to BW in the future!!!!!!! Thank you for staying with us during your recent trip. We are proud of our all suites hotel which offers large and comfortable rooms. We recently upgraded our breakfast room and soon will start updating our rooms. We hope to see you again soon. I'll start by saying the hotel is very comfortable. The front desk staff was very accommodating and the breakfast attendant was outstanding. However, the entire experience was ruined by the actions and comments of an overly opinionated and racist General Manager. My wife an I returned to the hotel after taking care of our business dealings for the day. We boarded the elevator and before we reached the room, the phone was ringing. It was the General Manager saying in a very angry voice, "we don't allow those activities on this property ". He was clearly implying that because my wife is an attractive, younger, African American, and I'm an older white male, that we must be doing something illegal. He would not allow us to stay another night. I have never been more insulted in my life. I have stayed at this location several times, but will never go back. Sorry that you misunderstood us, but we were just referring to Corporate Lodging Guidelines. If you use your business travel card, which in this case you used, that card only pays for 1 person and strictly is for business use and what we saw was your whole family staying on that CLC card. If Corporate Lodging knows about the abuse of their card, they could put us and you into trouble and could create issues with negative impacts to our business. There was nothing to do with your wife or kids. Next time if you plan to stay with us along with your whole family, please pay with Cash, credit or debit and you should be fine. "Great place to stay when traveling"
While on a family trip heading to Indiana we stopped in Pickerington, Ohio looking for a room for the night. We were greeted by Nicole who asked us if we had AAA, AARP or were eligible for any discounts. This extra time taken allowed us to save on our night's lodging. The room was great and had a nice separate seating area. The beds were very comfortable and felt really good after driving for approximately 7 hours that day. The breakfast area was large and the space between tables was wide enough to get through without bumping into people who where seated. The young woman kept the area well stocked and checked often to see if refills were needed. My wife has a walker and this young woman (I unfortunately failed to ask her name and did not cannot remember read her name tag) came over without being asked and assisted my wife with carrying her plate and getting her juice. She also checked back several times to see if my wife or I needed anything. As we were leaving Maggie was at the desk and as she took our key asked if we had any problems while we were there or if there was anything that they could have done to improve our stay. I would definitely stay here again. "Bang for your Buck! " The location is a little tricky to find but it is safe and secluded near quality food establishments, retail stores and access to the highway. The parking is terrible due to construction workers parking in the main lot rather than behind the building. The furniture is worn from the entrance to the room. One of our remote controls to the TV did not work and no replacement was available. The wiring that connects the cable was tattered. The bathroom sink had mold growing around the faucet, and the linens were stained. Overall the stay was enjoyable and the staff were attentive. Thank you for letting us know about your stay. We are so pleased that you enjoyed your stay and that you had a peaceful business trip. We hope that we will see you again soon. Breakfast area was very busy, did not like that there was a sign saying, Food or Drinks Not Allowed to be taken out of Breakfast area. Refridgerator in room did not get cold enough and no freezer space in them either. Some loud and undesireable hotel guests there. This hotel has gone downhill and was not worth the cost. We are sorry to hear that your stay was not up to the high standards we set for ourselves and our guests. Our breakfast area is designed for the common messes that are associated with food service so we try and keep the food there to limit spills in other areas of the hotel. We hope to see you again soon. Our room was clean, quiet and so peaceful! We had the best person at the front desk who told us about things to do locally, and great restaurant suggestions too. We ended up visiting the American Motorcycle Museum nearby and then going to the Dawes Arboretum near Heath, OH not to far away. We are pleased that you enjoyed your stay with us and were able to relax. We love that we were able to give you recommendations to area attractions and you were able to have a wonderful time. We hope to see you again soon. I was really happy with the décor and how modern the rooms looked. The room was very clean as well as other parts of the hotel. The hotel was easy to find off of the interstate and it was very quite. The only thing that I did not like is that all of the smokers congregated in front of the lobby door and as a non smoker this did not appeal to me, but then again you can't count on people being courteous. This seems to be the case at every hotel not just this location. I stay in hotels for 10 months out of the year and I don't care which hotel it is the smokers always stand in front of the lobby door and smoke. Designated smoking areas away from the entrance would be great!!! Thank you for letting us know about your recent stay. We are pleased that you found our location convenient for your stay. We hpe that you will return again soon. "Huge rooms and great for families!" Extra large suites with queen beds, more than enough room for two. Comfortable, convenient, with enough lighting and tables and seats. The sitting area was great and would be perfect for a family with kids. The staff was very friendly and helpful. The only confusing thing that I found troubling, was the sign by the breakfast area asking guests not to leave the room with drinks or food. I imagine that it is so people don't load up their coolers for lunch, but there is someone there all the time! I rarely had to go find somebody, so the sign seemed a little in your face for those of us that would never dream of stealing food.....and what if your spouse or child didn't feel well and wanted to eat in the room? I just found that odd. All in all, the breakfast, coffee service, cookies, friendly staff, great rate, and extra large rooms are a joy and I'm going to try to stay here everytime we are in the area! Thank you! Thank you for letting us know about your stay and how you enjoyed our spacious and large rooms. As a all suite hotel, we hope that our guests can relax and enjoy the extra space. I want to let you know some of the reasoning on asking that guests keep the food in the breakfast area. The main reason is that we have had guests in the past that have had accidents, spilling their food throughout the hotel. This causes stains and can make the other's guest's experiences less than wonderful. We find that if a guest enjoys the food in the breakfast area, we can contain any mistakes in an area that we can quickly make ready. Plesae come back again soon. Me and my husband were very pleased with our Jacuzzi suite the room was very nice and clean. Free Wi-Fi and breakfast were great too. The lady at the front desk was very nice and welcoming very fast check in we will definitely stay here again. We are so happy that you and your husband enjoyed your stay in one of our wonderful Jacuzzi suites. They are a perfect option for a nice relaxing stay. Please come back soon for another wonderful stay. We hoep to see you again soon. The hotel could use a bit of a face lift. Half of the ceiling tiles were out of the ceiling in the lobby. We stayed on the 3rd floor and the hall way stunk. The rooms were ok but could use a little TLC. The pool was gross....wouldn't even let the children swim in it. It stunk, was dirty, bugs floating in it, etc. The breakfast was ok...thought there might be some muffins, pastries, etc. but there were none. The hotel is in a nice location and the Mexican restaurant right in front of the hotel is delicious. We stayed at this hotel the year before last and it was nicer then. I would probably stay here again, however, it does need a little face lift. Thank you for letting us know about your stay with us. We apologize that there were areas that did not meet your expectations. We are scheduled to start a renovation in the coming months and we expect that changes to make this hotel your favorite. We will keep you in the loop about the upcoming changes. We hope to see you again soon. Thank you for letting us know about your stay with us. 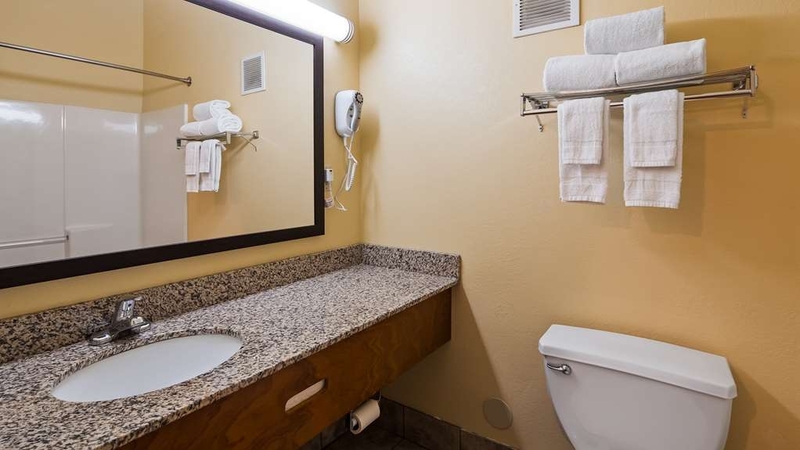 We agree that our location to so many different conveniences make our hotel a great choice. We appreciate you letting us know about the doors closing a little hard. I will have our maintenance staff take a look if our auto closing hinges are a closing a little strong. We hope you will return soon. "Guests need to show respect"
Stayed 2 nights during a nearby business training in Pickerington. At approx. 10:00 p.m. the 2nd night, our group was awoken by small ball players and their parents. We could not believe the children were allowed to run the halls and scream until at least midnight. The parents yelled back and forth to each other in separate rooms throughout the night. It appeared the parents were possibly intoxicated, so our group got to listen to shouting, ice machines and running/stomping that night. The management should have booted this group to the curb. We told the desk with at least 3 individual room calls that there was a problem. We personally asked this group to quiet down so we could sleep for the next day. Law enforcement should have been called as management did not have the situation under control. Our room was clean and breakfast was average. During the stay at Best Western Executive Suites - Columbus East, my stay was very clean and easy to come and go for my business stay. The breakfast was good and the internet was decent. I really enjoyed this hotel. Thank you for letting us know about your stay. We are pleased that our location was suitable for your needs and that you enjoyed our breakfast. I hope we'll see you again soon. "Set the AC up as soon as you arrive!" The arrival process was great. I prefer a top floor room and was surprised/disappointed to be on the ground floor. This was further confirmed when later on guests in the room above arrived. I am always conscious of closing hotel doors quietly and walking "above someone else". Sadly the team of elephants above me had no issue with either of these items when they arrived. It was not helped by the fact that the AC was set to "Antarctic" mode by either housekeeping or the previous occupier. Having set it as high as it would go on heat it took a very long time to get to a comfortable temperature. The design of my room had a lobby area with sofa, work desk etc, then the bathroom and finally the bed. The walls are all concrete material so plenty of echo in the lobby/desk area. The hotel is close to a large shopping area and walking distance from a Longhorn Steakhouse so good news there. The website shows rooms with Jacuzzi and other treats, can't comment on this as I did not see any of it. Thank you for giving us a quick recap of your stay. We are sorry that we did not have rooms on the top floor available when you arrived. We apologize about the guests above you that were not very considerate. When you return to stay with us, we hope that if you have any issues, you will let us help you correct the issue. We hope to see you again soon. We are so pleased that you had an enjoyable stay with us. We certainly try to provide high quality accommodations at a good value rate. Above all, we are glad that our staff treated you with the respect you deserve. I have stayed at this hotel several times a year when visiting family. I have never had a problem and the staff is outstanding. Great location right off the interstate. Dining whether it be fast food take out or dining in is plentiful in the area. So if visiting the area or just passing through for 1 night you'll enjoy your stay!! We love our guests and especially our guests who stay with us as often as you do. We appreciate your kind words and hope that we will see you again soon. "Overpriced for what it is"
Stayed there for 7 nights and was the weirdest best western I stayed in. Location is good to travel around and there are shops nearby. Room is big with a fridge and microwave, 2 TVs which didn't work well. Free wifi with excellent connection Besides this, the room is dark and sooo oldish decorated. Staff non existent and not helpful. My bathroom has ants crawling around and when I asked reception to do something about it, the girl said there's nothing they can do because it can happen!!! What the heck??! Don't expect fancy toiletries as it's only a tiny soap and a small tube of shower gel. I don't know what their safety policies on females traveling alone but I didn't feel safe when they put me in a room on ground floor right at the entrance where in the evening they are lots of guys outside talking and smoking. Couldn't open curtain nor feeling comfortable in the room as curtains are see through!! Never encountered a safety issue like this with other hotels chains. Carpet smells and look dirty Forget the breakfast unless you just want to eat junk! Choices are tiny filled with sugar: cereals, donuts, waffles, bread.. There's sometimes eggs and sausages but that's it! Had only breakfast once! That hotel is in big need of renovation and upgrade. Else it really not worth the price they charge!! We apologize that your stay did not meet the high standards that we set for ourselves. I will speak with the staff to make sure that they are better trained to handle situations such as ants and other issues. I certainly understand how you feel on the first floor as there some people who prefer the first floor. When you return to stay with us, we will be happy to make sure you on a higher floor. Please come back to stay with us soon. "Great option for the money"
We were timid from the presentation of the lobby. Our family of four fit nicely in this oversized room, which had a "living room" sofa & TV. Our double bed room featured a second TV as well. The room was clean. This hotel is in desperate need of an update but helped us manage our expenses on a week long road trip. Breakfast was good; oatmeal, coffee, juices, cold cereals, pastries, fresh fruit, & waffles. "Great Value for a Great Location"
This property is right off the Interstate Highway (70) which makes for an easy on and off. Many local restaurants nearby. The hotel was very nice, clean, quiet and comfortable plus the price was right for a quick one night stay. "Large room. 2 TVs. Good for family." Nice clean room. Quick stay on our way out east just needed to stop for the night. Plenty of space in the room. Couch, coffee table, tv, desk in front area of room.. bathroom was clean few minor reparis could be done but clean. Large counter area, microwave, refrigerator. Two bed room, second TV in front of bed. Great room for parents. Breakfast area was clean, attendant present. Did not look at other amenities. Only negative which did not affect us at all was faint smoke smell in halway on front of elevator. "Great location and very nice hotel." 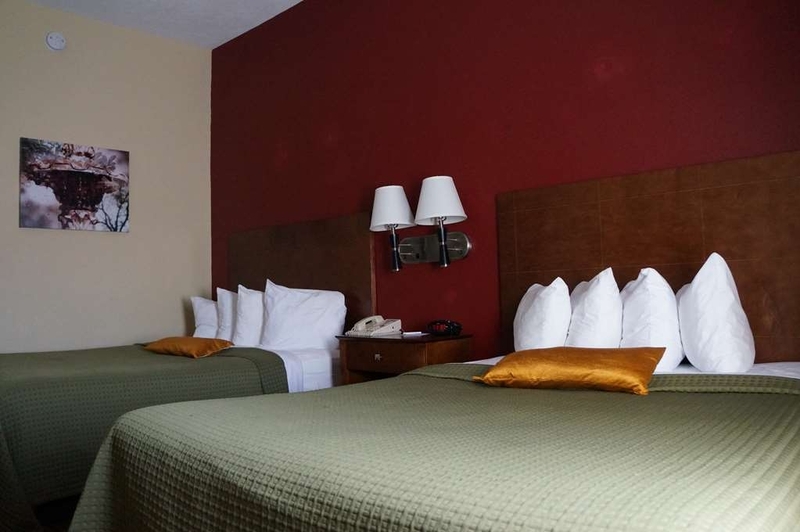 Excellent hotel with very large room size (King room with separate sofa/tv area), very clean, close to interstate and restaurants and yet still a quiet location. Great hotel choice for the money when in the area. We were staying on an overnight stay while traveling, but would recommend this hotel for a quick stay or an extended stay. Stayed here on my way from PA to Indiana and it was perfect. Checked in late on a Thursday night and the late night staff member was super friendly. Bed was very comfortable and large (had a king room). Breakfast was good with a decent selection for a free breakfast. Check-out went well and again staff was very friendly. "Awesome!! Don't go anywhere else"
"I do not understand why people are giving this hotel bigger favorables!" The staff, breakfast, and location are about the only good things about this hotel. The property, building, and rooms need some serious repair and renovations! First, my room needed to have vents and closet doors secured. There was a large hole in the window curtains. The panel where the air conditioner is located was also loose. Second, the rooms have paper thin walls and ceilings. I stayed at the hotel for 14 days and it was noisy for most of the time there. The weekends were the worst because there were children running around, and there was some kind of teenage party a couple rooms adjacent from me. I changed my room because of the noise, and my second room had as many problems that needed to be repaired. The swimming pool area is small and dirty. Since there is nothing else for children to do, I do not understand why there were many families who stayed at this location! This hotel is the worst for anyone visiting on business. Stay somewhere else. Best Western corporation needs to seriously look at this hotel if they want their name attached to it! Hotel is clean, breakfast is good, rooms are spacy. Only drawback is small beds. I would definitely stay here again. Best value in Columbus! The hotel staff was very nice as well. We checked in late and left early, so it was a quick trip but a very good one at that. "Noisy Little sleep for us." A gathering of youngsters was in play when we arrived. They were noisy and not well supervised. This meant we did not sleep well to slamming doors, running in the hall along with loud talking. Staff said they would take care of problem if need be. Didn't even try to have breakfast due to the youth overtaking the breakfast room. 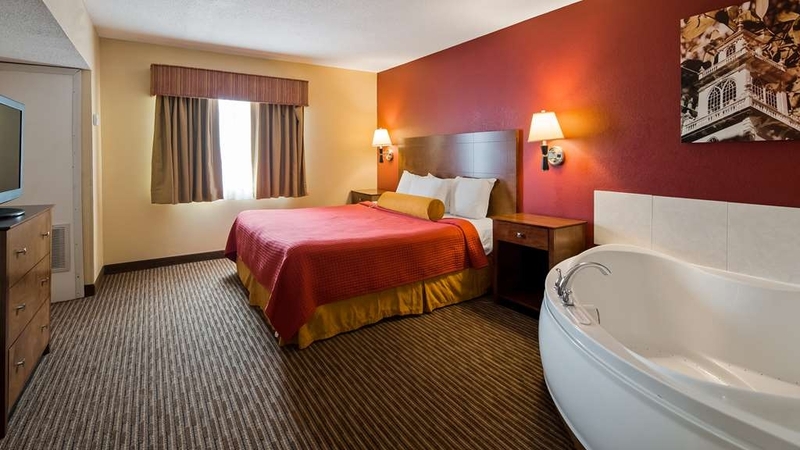 "Very Impressive and a great value"
I have stayed at many hotels all over the U.S. and I must say that the Best Western Executive Suites- Columbus East was one of the Nicest rooms (King bed suite with Jacuzzi tub) at the best value you can find. The people are warm and friendly. The Hotel is neat and clean and central to all shopping, restaurants and major highways. Wonderful place! This BW has a unique room layout which features separate bedroom and sitting room areas - on either side of the bathroom and counter-top corridor with fridge and microwave, etc. Flat-screen TVs are included in both rooms. Excellent hot buffet breakfast service. I was pleasantly surprised at the size of the rooms at this hotel. Each room has a separate living area and bedroom, with bathroom and kitchen area (though no sink) dividing them. The lobby décor and design is very welcoming and the staff were friendly. 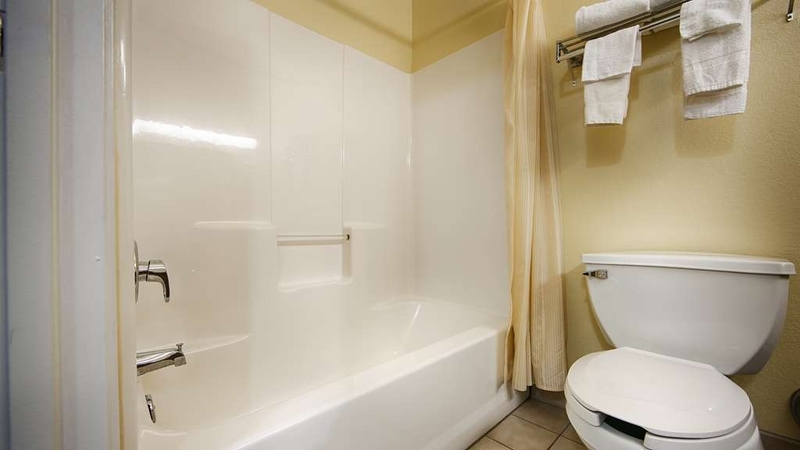 The room décor is rather dated, but everything is functional and well exceeds what you would expect for the price. The hotel is set back from the main road, so there is little traffic noise, though there appears to be a lot of bird life in the area behind the property which can be somewhat noisy. There are a few restaurants within walking distance. I got take-out at the Mexican restaurant and was surprised at how busy they were for a Wednesday night. After eating the food I can see why. The food was fantastic. The Seafood Sopa was especially good with whole crab legs, shrimp, scallops, and pieces of fish. It is a must try. This was a nice hotel, and fairly priced. The staff was nice, but really did not go out of their way to be welcoming. We arrived early, and we knew our room might not be ready, but typically when that happens, you can still register and then come back later for your room key. Upon being told our room was not ready, I asked if I could sign in and just pick up our room key later [we were in town for a hockey game] and I was told "no". No other option was given. When we stopped back to check in, I mentioned that I tried to at least sign in earlier and, again the staff was nice enough, but they quickly defended the girl from the previous shift saying how busy it was and she was having a rough day. I appreciate the fact they wanted to stick up for the girl, but at that point, I really didn't care what type of day she had. Later that evening, upon returning after the hockey game, we noticed one of the cars in the parking lot had its lights on. We wrote the model and license plate down to let the front desk know. A nice gentlemen at the desk informed us they don't take license plate information so there was nothing he could do. He further explained he didn't think a guest would appreciate possibly being woken up at 11pm at night to be told their lights were on. I commented they might not appreciate waking up to a dead battery. He chuckled and said "good point". With a little more guest service training, this stay could have easily been changed from Average to [at least] Very Good. After a long drive and arriving at the hotel late in the evening, our confirmation for two rooms was for a different night a month earlier due to our own mistake! The clerks at the desk were very helpful in getting us rooms on the spot, and offering information on how to correct the issue so we would not be charged for two different stays at the hotel. The manager was quick with his reply and offered a solution that was to our satisfaction. We are so happy that Best Western chose our comfort and satisfaction over charging us for two rooms that we did not use! Thank you Best Western, Pickerington, Ohio! "Visiting someone in Pickerington for a baby shower"
"Nice place, comfortable and good breakfast"
This was a very nice place to stay. The bed was comfortable and breakfast was delicious. The staff were all very helpful. I would stay there again. I was glad I didn't spend the extra money to stay somewhere else. This was a good price and great place. "2 Night Stay During the 2016 Arnold Sports Festival"
This was a very nice and reasonably priced hotel for our 2 night stay. All the hotels in the are were full and very high priced due to the Arnold Sports Festival. We booked our room about a month and a half in advance and got a great price through Hotels.com. The room was very clean, had a living room type area with a couch and TV, a small kitchenette with a sink, coffee maker and mini fridge. Bathroom was very clean and bed was comfy. We stayed in a room at the end of the hall, but I could still hear people taking in the hallway at night, but it wasn't horrible. The hotel also offers a free hot breakfast, which I did not partake in since I had packed my own meals for the weekend. They also have a pool which looked ok and a tiny little fitness room with a back extension, treadmill and bike (I think). The hotel is located near a lot of stores and right off the highway. All in all I would recommend a stay at this hotel if in the area. Great stay at this hotel in Pickerington, a suburb of Columbus. Tucked just off the highway, easy access to everything. Liked the room layout - public and private space, two tvs, plenty of storage, clean and well-kept inside and outside. Would definitely recommend this hotel for business and leisure trips and look forward to staying again in future! Stayed here 3/8-3/9. Nice hotel. Motorcycle hall of fame right up the road, lots of restaurants in vicinity of hotel. We had an early check in without any problems. My credit card was charged although I had already paid through expedia. When I talked to the front desk he did cancel out my payment from my credit card and I'm waiting for it to be put back into my account. (some banks have a 3 day hold period so it should be back in tomorrow if not I will be calling hotel). Rooms are spacious and had 2 tvs, clean and pleasant experience. The couch in the room was wore out and outdated but we didn't use it much. Quiet, breakfast was good and the staff taking care of breakfast was extremely friendly and sweet. I would recommend this hotel in the area for the price. Room and motel were great we went on a tough weekend when all pricing in Columbus was up for Arnold invitational. Motel was a $40 cab ride from downtown but the hotel itself was well taken care of though a little outdated but perfect for what we wanted. Thank you for staying with during a very busy weekend. The Arnold Invitational is one of the areas biggest events so we are glad you chose to stay with us. We love to hear about our guests and are pleased that we could provide you with a relaxing experience. "It's not as scary as some of these reviews have said"
Thank you for letting us know about your recent stay. We agree that our hotel offers a wonderful and relaxing experience. We are planning upgrades and improvements in the future so we hope that your next stay will bring you a beautiful surprise. Our room décor was okay, but the floor had bumps in it and the carpet was coming from the wall. The overall hotel was neat but was in need of updating and showed signs of wear & tear. It was the least expensive price in the area of about 5 hotels. Diane, thank you for letting us know about your stay with us. We are preparing for the process of updating our rooms so that our rooms will match the wonderful service of our employees. We hope that you will stay with us again soon and that we can surprise you with the new decor. wonderful place to stay. convient to get in and out of. had a lot of snow. cleared off parking lot by the time I left out! they were very understanding made life easy for me and my son. even helped us find a very good resteraunt to go to. The hotel had a Very friendly staff. The breakfast was good, they had a variety of foods for everyone's taste. Overall this hotel was a great experience. I would stay here again and definitely recommend it to others as well. It was an excellent experience. When I booked the room, it was easy and the person who helped me was wonderful.I would fully recommend this hotel. The rooms were clean and neat. The breakfast was fabulous and the service was great. Thank you so much for your kinds words. We are glad that you enjoyed your stay and that our staff was able to make you feel welcome. We hope to have the privilege of hosting you again. "Very Pleased with Hotel and Service"
Thank you so much for letting us know about your stay. We are happy that you found our hotel comfortable and you were able to have a relaxing time with us. I am glad that our sinks were able to leave a good impression. We hope to see you again soon. 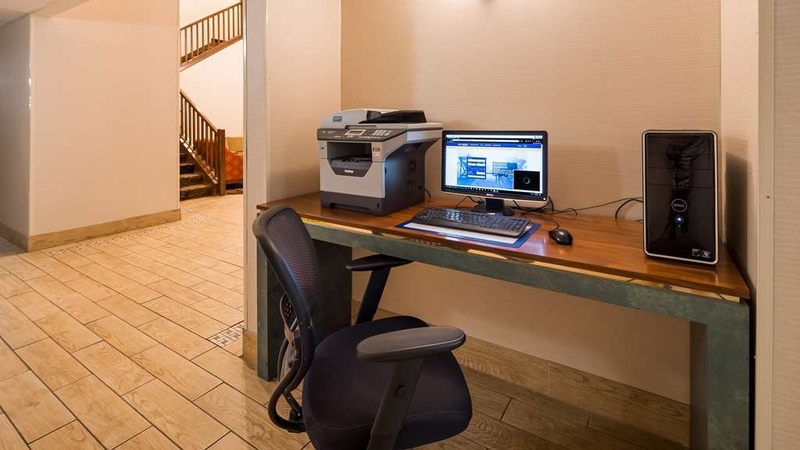 If you are looking for an affordable, comfortable and pleasant place to stay while traveling, Best Western is consistently the best place to rest, get some work done and have fun! This chain of hotels obviously works hard to provide a consistent, comfortable experience for its customers - no matter what city it is in! Thank you so much for your wonderful response. We are pleased that you enjoyed your stay. We hope that you will return soon. My husband and I have often stayed at this Best Western and recently had another good experience. The suite had two television sets, microwave and refrigerator, and the breakfast was great. The staff are all very helpful. We are so happy that you returned and stayed with us. We are pleased that you enjoyed your stay and that our staff was able to make you feel comfortable. We hope we will see you again soon. This all suites hotel if so wonderful to stay at because you have so much room to spread out in. The staff is so friendly and helpful. This extends to all staff from check in to breakfast staff to rooms staff. Thank you for letting us know about your stay. We are so happy that you enjoyed our suites. I am particularly happy that our staff was able to make you fell at home and that you were able to relax and enjoy your stay. Please return to stay with us soon. Sorry that you are outraged, but the policy is quiet clear if you are paying cash you need to put extra $150.00 as deposit which will be refunded back if no damage is done to the room.This policy is consistent throughout the hotel industry whether you like it or not. If you pay by credit card we will not ask for $150.00 in cash deposit but there will be an additional hold. If you still have questions please give me a call and I will be happy to discuss this in detail with you. Close to I70. Rooms were clean and larger than your typical hotel room. Bed was fine, but linens were sub par, including the tiny, rough towels. An upgrade in the linens would be a huge improvement in my book. The shower was the highlight...lots of super hot water...no flow restrictions here. The noisy garbage truck at 6:10am was a bummer. Breakfast was the usual bagels, yogurt cereal etc. There was a hot offering: sausage, potatoes and eggs. Was disappointed that the eggs were painfully powdered. Not worth it. As we were leaving the breakfast room I did discover a bowl of fresh fruit tucked back in a corner. Wish I'd seen that first and stuck with that. All in all...adequate for a close to the freeway night's sleep, but nothing special. We appreciate your comments about our breakfast and other concerns. I will work with our trash collection service to see if we can delay the pick up. Also, I will speak with our breakfast attendant about the eggs and better presentation. We hope we will see you again soon. Enjoyed the stay at Best Western very much. The staff was very helpful and considerate and the breakfast was very good with friendly staff help. Check in went very well and a statement was under my door on the day of departure and all was correct. Thank you for letting us know how you enjoyed your stay. We love to hear from our guests and how we made their stay comfortable. We hope you enjoyed your conference and that we will see you again soon. This is the best hotel i have stayed at. All rooms are spacious suites with each room having it's own heating/cooling unit.. Excellent value for your money. Caring and helpful staff. Minutes from 35 metro parks and many stores. We are so happy that your stay with us was so pleasant. I will pass along your comments to the staff. I look forward to having you stay with us again soon. Thank you again. good value for the price. clean, quiet. good location. the pool was closed but was told the filter had just been changed, i understood but it was still closed and unable to use. convenient to many shopping and restaurant locations. also easy access to interstate. 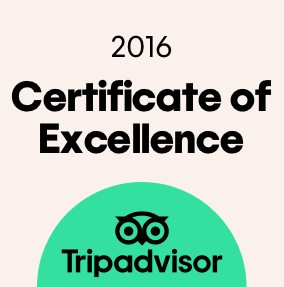 Thank you for reviewing us on TripAdvisor. I am sorry that the pool was closed during your stay and I will make sure that I follow up with our maintenance staff. We hope that you will return to stay with us soon. I stay at this hotel every month and have always had a very good experience. Rooms are always very clean, staff is top notch with a smile always on their face, and the breakfast bar is very good. Beds are very comfortable. Thank you so much for your wonderful review of our hotel. Our loyal and repeat guests are so important to us. We are pleased that we are able to provide the personal service and attention you deserve. Please let us continue to host you when you are in the area. "Excellent Service and Great Rooms"
I have stayed at this hotel several times over past few months, each time the service has been great. The rooms are very spacious as are the bathrooms. All rooms have a fridge and microwave in it as well. Comfortable beds, A/C works great. Clean rooms. Will definitely stay here again when working in the area. Thank you so much for your kind words. We are so happy that you have stayed with us so many times over the past months and that you have enjoyed your stay. We hope that you continue to choose the Best Western Columbus East whenever you are in the area. Stayed for 5 days 10/19-10/23 Hotel was nice for the price. I was in room 114 Big room set up nice bed room and liveing room. I was there for a class so I had plenty of room to study. Only down side was in this room 114 was it is right next to the kitchen and they start setting up early and it gets kind of loud. So if you like to sleep in dont stay in 114. Room was clean bed was good. Over all I would give it a 7. We glad that you enjoyed your stay with us. We appreciate hearing from our guests letting us know how we can improve our service and provide the best service possible. Please stay with us when you are in the area again. Thank you. "Good experience, ready for update. " Looks like the hotel was updated 15 years ago. Front desk was friendly & helpful. The suite/room quiet, large with a window that overlooked a wildlife pond. Window was no opening. Room was clean, but bedding seemed old. Smelled like smoke in the hallway. Beds were firm and comfortable. Shower was good. Free Breakfast was well stocked standard fare and they had waffles. The kids always like that. Indoor Pool was clean but small. No hot tub. Thank you for letting us know how your stay was. We are pleased that you and your family enjoyed the breakfast and pool. I will check with our Housekeeping Supervisor about the smoke smell and how we can make sure that you do not have this issue again. Please stay with us again when you are in the area. Thank you. This all suite hotel is the best we have stayed at. The suites were well appointed and large. The price point was will worth it. The breakfast was one of the best we have had on our 8 day road trip. I would highly recommend this hotel to everyone. Thank you so much for your kind words about your recent stay. We are glad that you enjoyed our suites hotel and that you were able to relax. We hope that you will return and stay with us during your trip. "Beautiful and spacious accommodations but NOISY"
We were pleasantly surprised to find that the suites were so spacious and updated. The bed was super comfy and we enjoyed a great nights sleep. Unfortunately, we were awakened at 8am on Sunday by the housekeeping staff who were running their sweeper into furniture in the room above us. That, plus the horribly noisy plumbing, kind of ruined it for us. We went on this getaway to relax and sleep in... Not possible with paper-thin walls! Thank you for letting us know how your recent stay was. We apologize that the housekeeping staff was noisy and caused you to wake up early than you hoped. I will work with our Housekeeping manager to make sure that we minimize the noise as much as possible. We stayed here for a night before our daughter's regatta at Hoover reservoir. The room was so acoustic and WiFi worked great. Beds were decent and bathroom was clean. Breakfast was good with a decent selction. Eggs were powdered though. We would stay here again. This location is out of the way, almost difficult to find. I like the way the suite is laid out, but the air conditioning does not work well in the room. The TV was grainy, but the bed was very good - but pillows not so good. We are disappointed that we did not meet your expectations during your recent visit. I will pass along the information to our staff with the hope that we can correct the areas where we fell short. Please give us the opportunity to stay with us again and we will be sure to exceed your expectations. We were visiting relatives and on the way home, decided to stay at the Best Westyern. 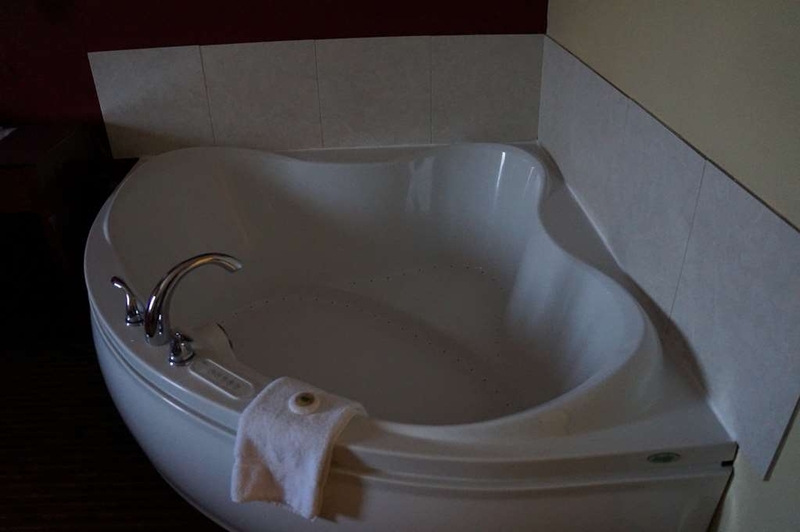 We got a jacuzzi tub.The room was hugh. It had a living room, and bedroom with king bed. The staff was very nice, breakfast wasn't the greatest but it was included. This was our second stay at this hotel and it is very nice. The large suite rooms are great for extended stays. Breakfast is very good and staff is friendly. Have yet to use the pool but it looks nice, a whirlpool would be a great addition. Thank you for your kind words. We are so happy that you enjoyed our large rooms and amenities. We hope that you will return to stay with us soon. Thank you for choosing us. "Affordable and decent for the price"
Seem to make the most with what they have. Getting a little dated and worn but things were clean. Immediately off the elevator on the 3rd floor it reeked of smoke however. Rooms were clean and spacious, bathroom was big, AC worked great. Pillows lacked quite a bit so bring your own! Front desk staff was very helpful and courteous. Breakfast was good, eggs, bacon, potatoes, waffles, and the usual cold fair. For the weekend price of just under $100 it was a decent place to stay, not top of the line but would probably stay there again. Thank you for letting us know how your recent stay was. I passed your comments along to our team so we can research why there was a smoke smell near your room as well as uncomfortable pillows. We pride ourselves on comfort so we appreciate you let us know where we can improve, Thank you again for staying with us. Huge room with two tvs and a kitchenette. Very comfortable beds. Im pretty picky about smells and hygiene. And this hotel has made me happy everytime I stay there. I will have a class to attend the same time next year and will be using this hotel again. We are so pleased that you enjoyed your recent stay. We are especially happy that you are a frequent guest. We will continue to work as a team to make your stays as comfortable as possible. The beds were small for "queen" size. Some our our beds in our room block that were requested as two doubles or queens ended up being a king only, so that was a disappointment. The service and continental breakfast were five for this hotel and price. Thank you for posting your thoughts on TripAdvisor. We love to hear from our guests. We are sorry that we could not provide the room types originally reserved. As you can imagine, there are several factors that affect room availability. Guests could check out late, extend or a few other things but we are sorry that we did meet your expectations. We hope that you will return soon. Thank you very much for letting us know about your stay with us. We are pleased that you enjoyed our hot breakfast and amenities. 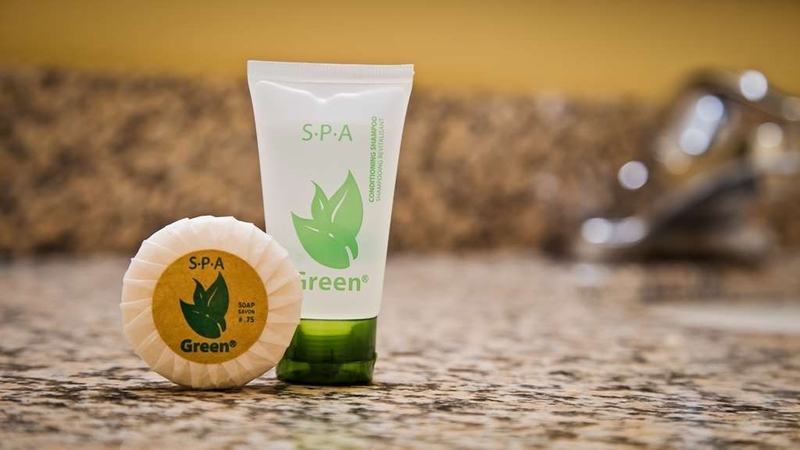 We love to make sure our guests have a relaxing and enjoyable stay. Please come back and stay with us again.